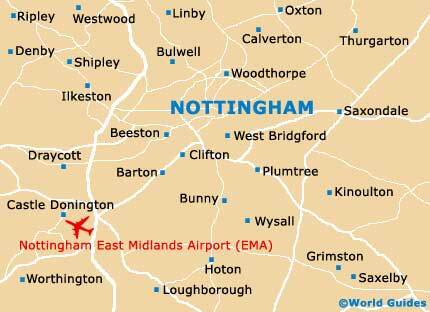 A historic city made famous by many stories and legends, Nottingham contains more than its fair share of historical buildings, landmarks, memorials, statues and monuments. 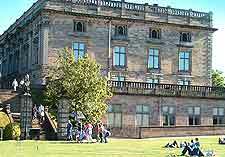 Of course, the most famous of these is without doubt Nottingham Castle, and although this has been rebuilt many years ago, it is still a worthwhile attraction, offering much to see and do, including a museum and art gallery. 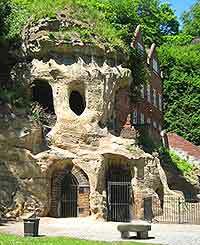 Other notable landmarks in Nottingham include the ancient sandstone caves, which are scattered underground, around the city. Those looking for a tipple and a bite to eat must make sure that they pop to one of the country's oldest and strangest pubs, Ye Olde Trip to Jerusalem. Once standing on this site, the original Nottingham Castle was knocked down following the Civil War and its replacement built in the 1670s. 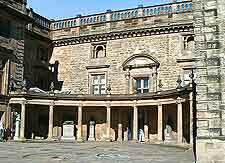 A classical ducal mansion enjoying an elevated situation, the 'castle' is worth visiting for the views alone. The cafe area to one side of the castle features outdoor tables, overlooking much of the cityscape. Also worth visiting is the castle's museum and art gallery, which first opened in 1875 and contains many important local artefacts and informative displays about Nottingham's interesting history, together with alabaster carvings and an extensive gift shop. Outside are large lawned areas, flowers, a covered picnicking spot and children's play area, while underneath the castle are King David's dungeon, a wine cellar and a number of manmade tunnels and caves, including the 'Mortimer's Hole', a particularly long underground passageway leading to the Brewhouse Yard. Nottingham city is known for its numerous sandstone caverns and underground tunnels, many of which are believed to date back to medieval times. One of the most easily accessible cave entrances can be found at the Broadmarsh Shopping Centre and leads to cellars, an old air-raid shelter, a historic tannery and a recreated Victorian slum area, all standing beneath the numerous busy stores at the shopping centre. Just 5 km / 3 miles west of Nottingham city centre, Wollaton Hall is home to a particularly extravagant Tudor-style architecture, built in the late 16th century. 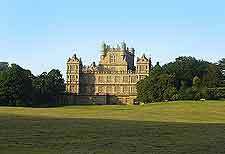 Wollaton Hall features large parklands spreading for around 500 acres / 200 hectares, landscaped gardens with formal plantings, period furnishings and a notable Natural History Museum. Also worth mentioning are the 18th-century Courtyard Stables, which have been converted to house a visitors centre, art gallery and steam engine house. The stable block also contains the Industrial Museum, which displays a large collection of oddities and local historic artefacts, including old bicycles and lace-making equipment. 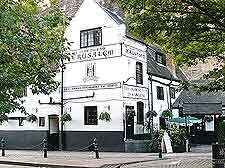 The ancient Ye Olde Trip to Jerusalem is famous for being one of England's oldest and most unusual public houses. Located in the Brewhouse Yard and just a short walk down the hill from Nottingham Castle, this historic pub is actually carved into the adjacent rock face itself and is said to date from the end of the 12th century. The pub serves traditional ale and English fare daily and features caved areas with much dark wood and stone, outdoor seating, summer flowering hanging baskets and a number of souvenirs, for sale over the bar.